by Louis Haghe from an original by David Roberts. When New York Times’ columnist Thomas Friedman travels to the Middle East, he brings with him a deep devotion to the state of Israel, and a longing for what he thinks ought to be. At the Syrian Border, Golan Heights — Who knew that the future of warfare would present itself with such serene beauty — like one of those warm 19th-century David Roberts landscapes of the Middle East. How so? I’m traveling along the Israeli border road at the intersection of Lebanon, Syria and Israel, and off in the distance there’s a freshly snow-capped Mount Hermon, begging for skiers. It’s framed by Lebanese and Syrian villages nestled into terraced hillsides, crowned by minarets and crosses. The only sound you hear is the occasional rifle burst from Lebanese hunters. But this is no Roberts painting. It’s actually the second-most-dangerous spot on the planet — after the Korean Peninsula — and it’s the idyllic backdrop to what 21st-century warfare looks like. Because hidden in these villages, hillsides and pine forests you can find a state — Israel — trying to navigate a battlefield with a rival state’s army (Syria), a rival regional superpower (Iran), a global superpower (Russia), super-empowered mercenaries and maniacs (Hezbollah and ISIS) and local tribes and sects (Druse and Christians). Hold up there, Brother Thomas, do you expect us to buy this one-sided Friedman word- portrait that describes the state of Israel as a peaceful neighbor forced to live in “a tough neighborhood”, a favorite Friedman phrase? Parse that “hidden in these villages. . . ” paragraph. View it “realistically”, as Reinhold Niebuhr should have done when he was alive. The “battlefield” Friedman describes is filled with a “rival states’ army (Syria), [and] a rival regional superpower (Iran)”, two “rivals” that were established as states within borders drawn by the British. They were there long before invading Zionist colonialists arrived in the neighborhood and moved in with their peaceful Jewish villagers. Friedman sounds like Donald Trump when he identifies Hezbollah and ISIS as “super-empowered mercenaries and maniacs”. As for the Druse and Christians, they are tossed aside as “local tribes and sects”. Come now, Thomas, “tribes and sects”? I have labored under the impression that the Christian community has a pretty strong religious claim on land where Jesus was born, lived, died and was raised from the dead, to save the world. Christians of the world provide Israel with tourist profits, and many of them deplore the treatment of Christians in Palestine by Israel’s occupation army. Show a little respect, Thomas. I would also advise you, Thomas, that by lumping Hezbollah and ISIS in the same list of undesirables, you are exposing your Zionist bias. Hezbollah has a legitimate role in Lebanese politics. ISIS is a dangerous force distorting Islam in a quest for political power. Israel would have the world, with your help, see the Middle East as a potentially peaceful region, but only with the modern state of Israel as its unchallenged power center. Your description of the players in your “tough neighborhood” omits one major player, Palestine, whose land Israel seized by force and on which it has grown into a world military power. In your column, you tell us you rode “along the Israeli border road at the intersection of Lebanon, Syria and Israel, [where] off in the distance there’s a freshly snow-capped Mount Hermon”. 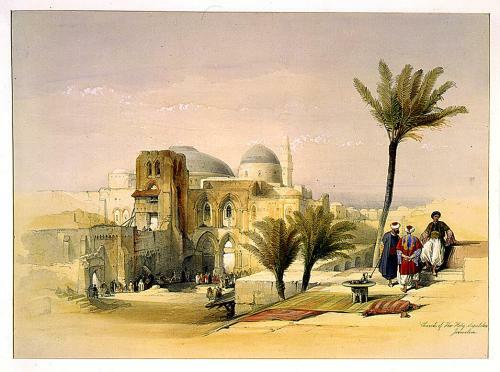 Brother Thomas, you looked at Mount Hermon, and referred to skiers, but you did not tell your readers that the state of Palestine is located just down from the heights of that famed Mount, which is on Syrian land. You did not tell them that your beloved Israel has held on to that Syrian mountain land for “security” reasons. And you did not mention that the Palestinian people have lived in the grip of a military-enforced occupation for more than a half century. During the visit which took you along the Israeli “border”, you would have benefited from an interview with a Palestinian peace negotiator who could give you a more realistic view of the state you ignored in your column. Saeb Erekat (right), the leading Palestinian peace negotiator, is the secretary general of the Palestine Liberation Organization. On Tuesday, he wrote an Op Ed for The New York Times under the headline: “Forget Trump’s U.S. as the Mideast’s Mediator”. The Trump administration, which blames the Palestinians for the recent stalemate, does not mention that our president, Mahmoud Abbas, tried to constructively engage with the [Trump] administration. Last year, between Feb. 7 and Nov. 30 we had over 30 meetings with administration officials, including four between the two presidents. Throughout that period, a Palestinian team took initiatives in presenting detailed and thought-out positions, maps and responses to the other side’s positions. [W]e support making Jerusalem an open city with free access for all, and a sovereign Palestinian capital in East Jerusalem. Instead, President Trump decided last month to take Jerusalem “off the table” — a step that encouraged Israelis to pursue policies in occupied East Jerusalem that seek to forcibly transfer the Palestinian population out of the city. President Trump, for the wrong reasons, has put the issue of Palestine back on the international agenda. If his administration’s inability to be an honest broker opens the way for other parties to become mediators, Palestine can engage in meaningful discussions on a just and final peace. This must begin with a time frame for ending the Israeli occupation and establishing a sovereign Palestinian state on the 1967 border, with East Jerusalem as its capital — a proposal offered and reaffirmed often by the Arab League. Palestinians would attain their inalienable rights, and Israel would enjoy normal relations with the region. While in Israel, Thomas Friedman had to be aware of the pending trial of 17-year-old Ahed Tamini, who along with her mother, are in an Israeli prison for reasons related to the incident in which a frustrated Ahed tried to push Israeli soldiers from her front yard. The family trials are being postponed for unknown reasons. The latest trial date is scheduled for March 11. From what we know, the only threat the Tamini family poses for Israel is the damage to Israel’s standing as a democracy. That so-called democracy is already on international bad paper for its continued occupation of Palestine. Are you listening, Brother Thomas? The David Roberts watercolor is from Wikipedia. 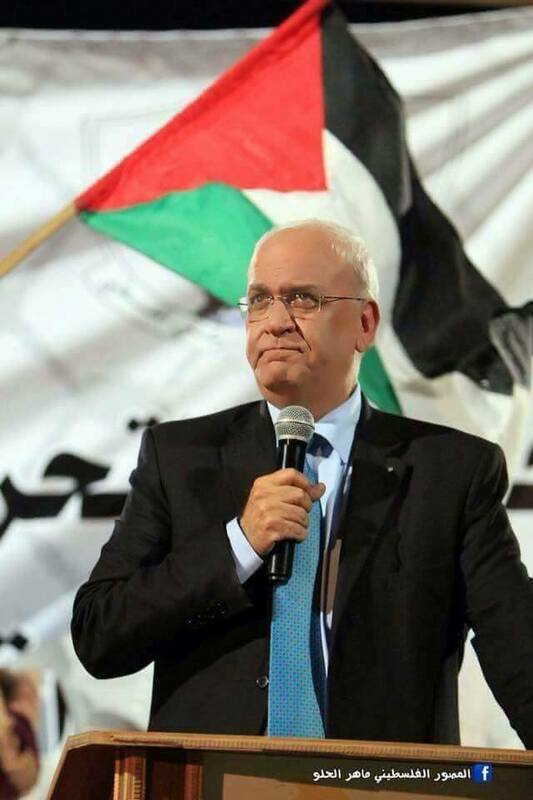 The picture if Saed Erekat is from Facebook. This entry was posted in Israel, Media. Bookmark the permalink. It would be great if you could get this published in a major news/current affairs publication as an article, op-ed, or letter to the editor. ** Zeev Sternhell is a Polish-born Israeli historian, political scientist, commentator on the Israeli–Palestinian conflict, and writer. He is one of the world’s leading experts on fascism. Sternhell headed the Department of Political Science at the Hebrew University of Jerusalem and writes for Haaretz newspaper. “Israel was responsible for at least 54 Palestinian deaths last year as it rejected hundreds of medical permit requests it received from Gaza residents seeking treatment outside the besieged strip, rights groups have said. As always, Jim, thanks for your insights. At the very least, of course, Friedman is ever so disingenuous in his portrayal of the current state of affairs in Israel.